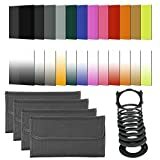 Kit includes: (16)Full & Graduated Color Filters(Blue, Orange, Brown, Pink, Red, Green, Yellow, Purple, G.Blue, G.Orange, G.Brown, G.Pink, G.Red, G.Green, G.Yellow, G.Purple) + (4)Full ND Filters(ND2, ND4, ND8, ND16) + (3)Graduated ND Filters(G.ND2, G.ND4, G.ND8) +(1)Sunset Filter + (1) Filter Holder + (9)Adapter Rings (49/52/55/58/62/67/72/77/82MM) + (4)Filter Carrying Pouches. The Full ND Filters(ND2, ND4, ND8, ND16)reduce the amount of light reaching the film without affecting the color. Can be used to enable slower shutter speeds. Great for portraiture and outdoor scenes. The Graduated ND Filters(G.ND2, G.ND4, G.N8)are a MUST for digital users, because the digital sensor unlike film has very low exposure tolerance. Detail will be lost on both low and high light area. To correct this, you need graduated filters to balance it! Full & Graduated Color filters(Blue, Orange, Brown, Pink, Red, Green, Yellow, Purple, G.Blue, G.Orange, G.Brown, G.Pink, G.Red, G.Green, G.Yellow, G.Purple) give your landscape and skin texture a more colorful touch. Perfect for changing the mood of a picture. The 49-82mm adapter rings are made of high quality anodized black aluminum(metal). Made of high transparent material. Provide different color temperature. The color temperature is stable and the loss is small. Include the largest selection of popular colors for controlling different light effects and color correction. Use combinations of these filters to create different effects, such as cool effects, enhancing skin tone in portraits, color correcting or matching ambient, simulating different kinds of light, cheating white balance etc. Control light and colour directly on your raw images at the time of shooting. Keep the quality of your images without excessive post production work. Specifically designed for your camera for a tight and secure fit. No wobbling or cross-threading. To use the square filter holder, slide the filter holder onto the ring adapter until it snaps into place. Simply mount the adapter ring and filter holder to the front of your lens, then slide in different filters to take beautiful, colorful shots. The filter holder can hold up to three square filters at the same time allowing for creative use of light correction or special effects.